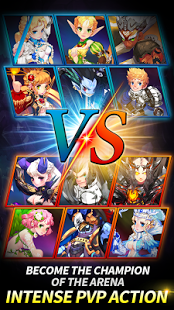 Dragon Heroes 1.0.4 Find out what happens when shooting meets RPG Experience intense shooting action at DRAGON HEROES Form the ultimate team of heroes, Play it with your friends and forge a powerful guild Dragon Heroes, it’s not just a game. It’s an adventure. Action-packed gameplay – Shoot, dodge and wipe out enemies with powerful skills. Form the ultimate team – Collect powerful heroes and runes to form your dream team. Power up your heroes – Grade up your heroes to the ultimate form. Various game modes – Scenario, Infinite dungeon, Boss raid and more. Guild – Join forces with your friends and lead your guild to the top.